FIRST- I realized I never announced a winner for the Abbisolutely pattern giveaway...blame it on my Halloween costume coma. #12 Alyssa, congrats! Email me with you info and I will get that to Abbie. When something comes especially for you...that isn't attached to an amount due by or a lucky you, you qualify for our new credit card..but that is beautiful and just glorious and sent for the sole purpose of making your day. Well a couple of weeks ago I got just such a delightful piece of mail. Remember Jessica from Just Enough Style and her lovely earrings? She sent me a pair of my very own beautiful earrings. Oh how excited was I! I mean seriously, get past my no make up face and that fact that I took this shot of myself, and how wonderful are those earrings in all their corally loveliness??? I LOVE them. I have already worn them a TON. Go and check out her site. 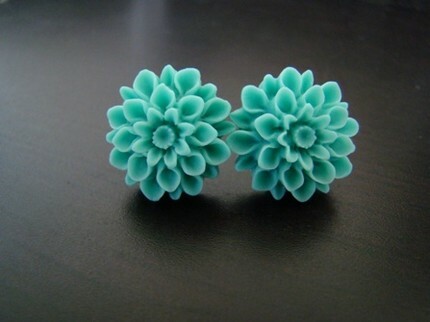 These earrings come in so many colors and they are so affordable. I already have them on my gift list for my favorite girlies. Yay! This makes my day!! I never win anything!